Perspective drawing is one of the skills that requires both technical and artistic understanding. It's technically demanding because there are rules that must be followed and if broken will ruin your drawing. Perspective drawing is artistically demanding because you must use your art-sense to use the rules in a creative way to come up with interesting and unusual solutions to your creative challenges. As always, you're never very far from another step by step tutorial that will show you how you can learn to use this amazingly powerful drawing technique. 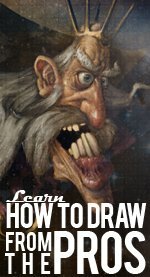 If you are just new to drawing, I would suggest starting with some of the easier tutorials on this site by clicking here. However, if you want to really take the next big step in your artistic development and skill-set then these perspective drawing lessons are the pefect thing for your to be spending your time reading. Now would be a good time to hop into the first lesson where you will learn some of the most basic and important principles of perspective, like what a vanishing point is and how to establish your horizon line. In this easy step by step drawing lesson you'll be introduced to the basic principles of perspective and then use them to draw a simple three dimensional house. Use this as your starting point and when you're finished come back and continue on with your perspective education. In this lesson you will learn how to create a perspective grid that will assist you in any kind of perspective drawing. You'll use your grid and learn how to draw circles that look good from any angle. Why Should You Learn Perspective Drawing? Before you move onto the next lesson I'd like to give you some info about why you should learn these techniques and how they can help you. This kind of technical illustration has a ton of uses from drawings for architecture, and product design to interior design and comic books. It's not the most technically accurate drawing, but still quite interesting. When you master this skill set what you will be able to do is show people how things look as they would appear in the real world. If you want to make money as an artist, or commercial illustrator, the ability to do this is invaluable. Imagine that you are an architect and you have just finished designing the newest, best looking skyscraper that's going to grace the New York City Skyline. Now, when the time comes to find someone to give you money to actually make this building, with the help of good perspective drawing you will be able to show pictures of what the building will look like and really sell it, which is much more effective than if you were to just show someone the floor plans for your designs. I personally like to use this kind of drawing to create interesting space ships and funky buildings like the images on this page. Believe me when I say that it would be impossible to get something to look this cool without using perspective; and why is it cool? It's cool, because it's believable. They follow the rules of how objects are viewed by our eyes in real life and are therefore more believable and exciting. From the first lesson you know perspective can be used to easily make a cube, but what are the next steps? Being able to draw a cube is nice, but I promised you being able to draw cool things, and the cube just isn't cutting it! 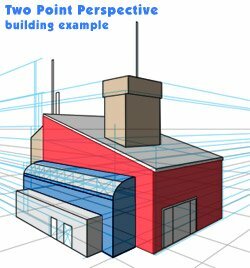 We'll first cover two point perspective and then move onto some additional perspective topics that will expand on what you learned in the first two lessons. Two point perspective is very useful for drawing common everyday scenes and in this lesson you'll learn how to add even more realism to your drawings. While similar to one point perspective, two point perspective will let us draw objects that are at an angle to the camera. This really opens the door to composing interesting scenes because the objects no longer have to face directly towards the camera as they do in the first lesson. After you go through these lessons you will have only just begun to scratch the surface of what you'll be able to do with perspective drawing. By now you'll be able to draw images like the ones to the right. But with a little more work you'll be able to produce images like those at the bottom of this article. This is where most books and courses on perspective drawing will leave you hanging, just when things are starting to get interesting. Don't worry I won't leave you hanging! More info to follow shortly! Why don't you sign up for the newsletter to the righ so that whenever there are new additions to the site you'll be updates as soon as possible.